This issue, edited by Drs. Robert Callan and Meredyth Jones, focuses on Digestive Disorders in Ruminants. 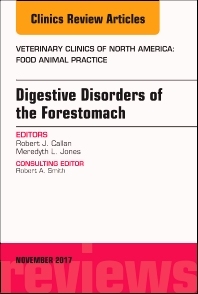 Article topics include: Rumen (Forestomach) Development and Function; Diagnostic Approach to Forestomach Diseases; Clinical Rumen Acidosis; Diagnosis and Herd Management of Subclinical Rumen Acidosis; Disorders of Rumen Distension and Dysmotility; Diagnosis and Treatment of Hardware Disease; Temporary Rumen Fistula for the Treatment of Forestomach Diseases and Enteral Nutrition; Rumen Microbiome, probiotics, and Fermentation Additives.